This chart shows the increasing significance of Social Security taxes in the contemporary United States. Although Social Security taxes are often described as "contributions," the program is funded by a dedicated payroll tax. The significance of that tax has increased significantly over the last forty years. Indeed, many Americans pay more in Social Security and Medicare taxes every year than they pay in individual income taxes. 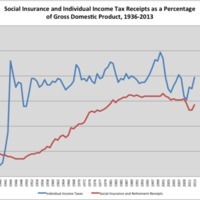 Molly Michelmore, “Social Security and Individual Income Taxes as a Percentage of GDP, 1936-2013,” The American Century, accessed April 20, 2019, https://americancentury.omeka.wlu.edu/items/show/30.